You might know that I'm from Panama City and my family still lives there, so when we visit I try to stick to my running schedule. 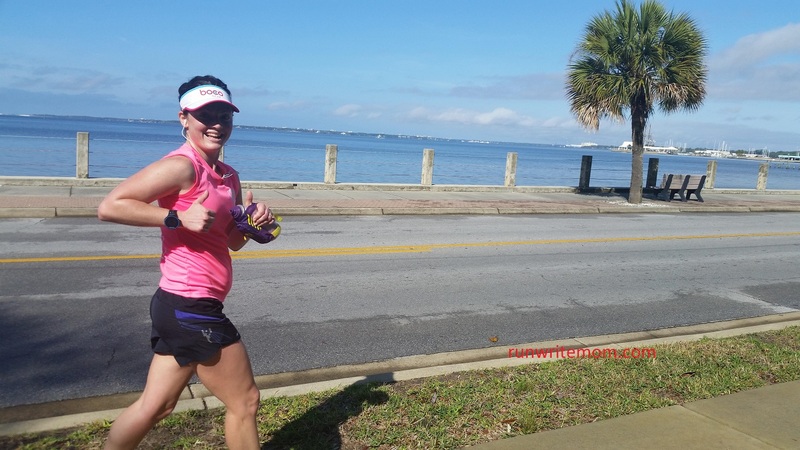 Unfortunately, Panama City isn't as runner friendly as Tallahassee, so unless you don't mind runs made up of many loops, it takes some creativity and planning, especially when you need to get a long run in. I've previously posted about running at Panama City Beach's new Conservation Park, which is good for a long run if you're staying out there or don't mind the drive. It is mostly sand/dirt though, which I know some of you aren't into running on. When I'm doing a run of only 3-4 miles, I'll usually just stick to my parents neighborhood. Even though it's a short run, that often means at least 2 loops. I like more variety in my runs. My parents house is not far from a park called Under the Oaks, that sits on the water. There's a dirt walking path around the park, that I want to say is 1/3 of a mile, maybe it's 1/5 of a mile, I don't know. I will run the path on the southern side of the park but extend my route to the perimeter of the park on the other side, to make it a little longer. You can also run down the beach a little ways here, depending on how high the water is on that given day. It's still annoying to make so many loops though. Panama City does have several parks dedicated to walking/fitness, but these "walking parks" really cater to the walk-on-your-lunch-hour-and-still-have-time-to-eat crowd (you like that hyphenated mess, don't you? ), they're really short and, you guess it, you have to make multiple loops to even get one mile. So, your best bet for a run in Panama City longer than 3 miles is to find an area with lots of sidewalks. You can do this downtown. The last time we were in Panama City I needed a shortish long run of 8-9 miles. I like to plan out my long runs, so I'm not leaving anything up to my tired, "I don't want to be running anymore" mind. So I took to Strava to plan out a route. I started my route at the St. Andrew's Marina. There's plenty of parking at the marina, even on a Saturday, and it's home to that fancy fish bike rack I've shown before. We start out heading east (you could go north here to make the run longer but there will be more pedestrian traffic, including some sketchy characters) past a park and then down a residential street before turning on to Beach Drive, where you could run along the beach for an extra workout or stick to the sidewalk. When going down Beach Drive, it's hard to decide which way to look, you could look out at the water/beach or check out the equally impressive houses on the sidewalk side. Don't worry, this is an out-and-back so you have the option to check out both. 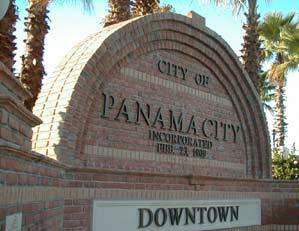 After traveling the scenic portion of Beach Drive, we head through Downtown Panama City, check out the antique stores, just don't be too tempted to stop for a hot dog at Tom's, you still have miles to go. Here you could head down to the Panama City Marina or just pass through like I did on this run. I chose to cross one bridge on the way out and another on the way back, not because I got lost at all. At the turnaround of this route is what I think is the best sidewalk in town. It's been redone in the last few years and now has palm trees and benches looking out over the water. There are sidewalks along both sides of the road here and I'll choose to stay on the side farthest from the water to get some shade. That's pretty much it, you can head back the same way you came of follow slightly different variations like I did. My mapped route from the marina is 99% on sidewalks and could have been 100%, but if you wanted to make your run a little longer you could easily take a couple side roads where there's less traffic or go farther down the sidewalked roads at either end. There's also the option of weaving your way up and down the sidewalks in the real downtown area, expect to dodge pedestrians who aren't used to runners though if it's a weekend. A lot of this area is great for biking as well, especially if you go past the turnaround (instead of turning around) and head into the neighborhood known as The Cove. It's a pretty popular area for road biking in Panama City and if you check out Strava groups for the area, most rides will be in this area or in Panama City Beach. Now, with my posts on running in Panama City and Panama City Beach, you have no excuse to not keep your running up if you go on vacation there.